This treatment combats cellulite based on the combination of a specifically designed cosmetic solution which is applied topically using the method of electrical impulses. The solution assists in the breakdown of adipose tissue and stimulates the regeneration of epidermal and dermal cells, strengthening the structure of the skin, allowing for a more firm and smoother texture. Localized cellulite is characterized by the appearance of nodules located in the dermal connective tissue which cause a bumpy appearance to the skin. This localized adipose tissue is resistant to the natural flow of liquids which detoxify and allow for healthy circulation, thus contributing to the build up of micro-nodules and edema. The specific solution used in the Localized Anti-Cellulite Program, acts as a vasoconstrictor, strengthening the capillaries and allowing for more healthy circulation. 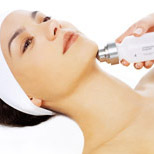 It stimulates lymphatic circulation assisting in the removal of toxins creating a smoother texture to the skin. The electromagnetic waves are transferred via roll-on applicator, allowing for a pleasant, relaxing sensation. This advanced technology ensures penetration of the active solutions and spectacular results.